NOTE: The catalog cover is included in your selected number of pages. The outside front cover is page 1, inside front cover page 2, etc. 48HourPrint.com gives you the advantage of high-quality catalog printing at very affordable prices. Be confident that your order will be handled expertly and your finished catalog will attract the attention it deserves. Our online catalog printing services are easy to use and are part of our industry-leading 48 Hour Turnaround Guarantee. Catalog printing is an excellent way to reach out to customers, using vivid imagery and descriptive text to show what your company offers. 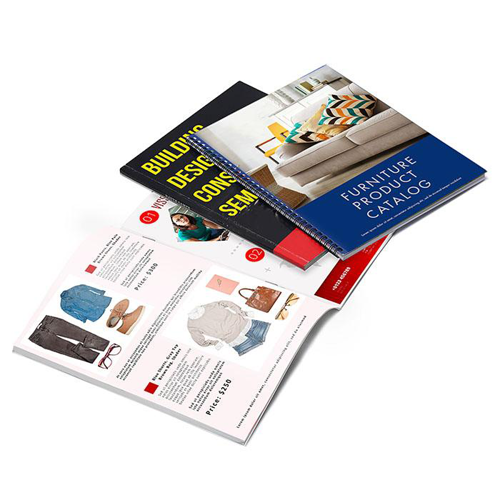 Catalogs printed by 48HourPrint.com can affordably and actively engage audiences, giving them a sales piece they will hold on to and reference. Catalogs can be an effective and lasting advertising tool that generates sizeable revenue for your company or organization. Catalogs are available in six sizes, from 8 to 48 pages. Our online catalog printing services feature saddle stitching, full color, high quality text stock with a choice of inside pages and cover on the same stock, or cover your pages with a thicker 80 lb. cover stock, and free gloss coating or matte coating. Choose to receive free PDF proof sent via email if you’d like. Review our catalog templates for layout guidelines that will help keep your print job on schedule.